Being a big, big fan of apple pie myself I could not resist passing this item along. 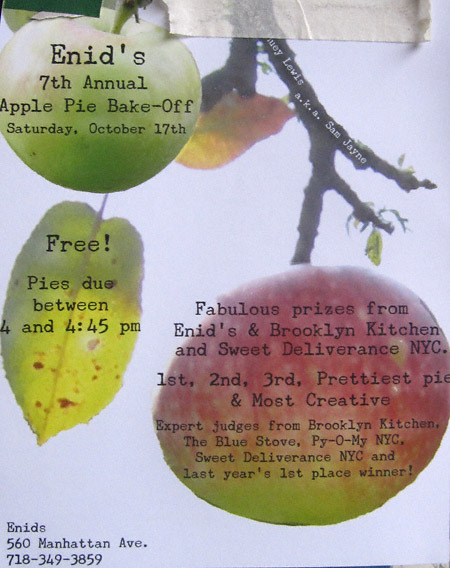 Interested entrants take note: you need to submit your pies between 4:00 and 4:45 p.m. and there is no cost whatsoever to enter! P.S. : Don’t forget that tomorrow the Lutheran Church of the Messiah will be hosting another Greenpoint Food Market starting at noon. Tip: try the pancakes at Bing. Very tasty! For more information click here or here (to check out their web site).